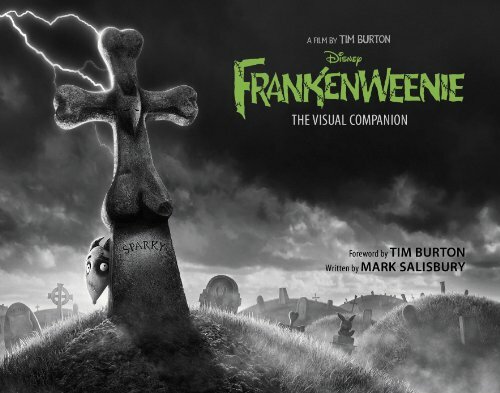 Here's the movie companion for Tim Burton's charming stop motion film Frankenweenie. It was originally a short film conceived in the early 80s and made in 1984. The 2012 film is a charming remake of that short film. This is a large coffee table book with a matte cover with movie title in gloss. It's 208 pages. The book is filled with concept art, storyboards, interviews and photos behind the scenes. Among the development art, there are even sketches by Tim Burton from 1982 of his short film. It's interesting to see the original Sparky the dog in sketch and his final stop motion figure. Included, of course, is the history of the original short film. The art and photos are printed huge. They look great, especially the photos of the stop motion figures. The character designs are stylish and they really make full use of the medium for caricature to create characters of all shapes and sizes and facial expressions. There are photos of character sculpts and their armature beneath. I love looking at studio photos just to see the working environment, how they create the characters and sets, and the overall organised chaos of a production set. This is a wonderful visual companion for the film.